Sleep can be elusive when you’re a new parent. There are nights when you try everything to get your baby to sleep, from nursing to rocking to humming—and then you do it all over again. Having a beautiful space for both you and your little one to retreat to can make those long days and nights easier. Let’s not forget a comfy place for baby to sleep because every minute counts in those early weeks! That’s where Simply Baby Furniture comes in. They’ve been helping new and expectant parents furnish their nurseries for over a decade, and this week we’re teaming up to give you the chance to add style and comfort to your little one’s space. 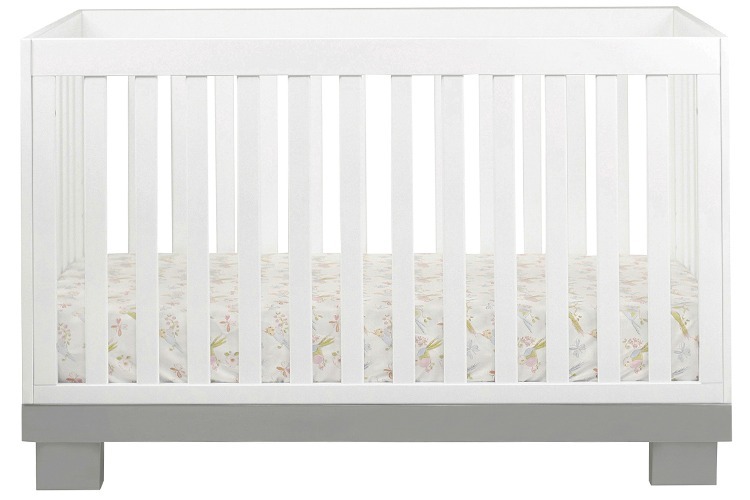 One Project Nursery reader will win a Babyletto Modo Convertible Crib and a Pure Harmony Serenity Organic Crib Mattress from Simply Baby Furniture (a $654 value). Simply Baby Furniture has the world’s largest selection of furniture for baby, and this year, they’re celebrating ten years as an authority in nursery preparation. Their team of specialists is made up of moms, dads and industry experts who will thoughtfully answer your questions and provide advice on nursery design, preparation, buying guides, baby safety and pregnancy/parenting. If you’re in search of a crib for a modern nursery, look no further than the Babyletto Modo Convertible Crib. You’ll fall in love with its sophisticated, sleek lines, and its low profile design makes it just the right height for you to comfortably reach baby. Not only is the Babyletto Modo crib stylish, but it’s also eco-friendly. It’s made from New Zealand pinewood from 100% sustainable forests with a non-toxic finish, rounded edges and closely positioned slats. When your baby is ready to transition out of the crib, the Babyletto Modo will convert into a toddler bed with the included guard rail. I love that it will grow with baby through toddlerhood and beyond—talk about a great investment! The Pure Harmony Serenity Organic Crib Mattress blends eco-friendly materials and high-quality design to create a safe and comfortable place for baby to sleep. Its eco-firm soy foam core is solid without making the mattress too heavy, and it features organic cotton layers, a waterproof organic cotton quilted cover and air vents. The most amazing thing about this mattress is that it has an infant side that is ultra firm and a toddler side with a natural Visco-elastic memory foam layer for extra comfort. Are you ready to add a whole lot of style, comfort and safety to your baby’s nest? WIN IT! One Project Nursery reader will win a Babyletto Modo 3-in-1 Convertible Crib in Gray/White and a Pure Harmony Sleep Safe Serenity Organic Triple Zone 2-in-1 Ultra Firm Crib Mattress from Simply Baby Furniture (limited to US residents 18 years or older only, a $654 value). I would love to win this crib. My baby is 6 weeks old and I do not have a crib yet. I would have loved to have known about this sooner. I’m single waiting for the arrival of my new baby boy Noah.